Shane Ferguson hopes to win the bragging rights when Northern Ireland take on the Republic of Ireland at the Aviva Stadium on Thursday. 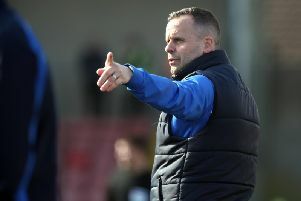 Shane Ferguson is hoping to have the last laugh over his two Millwall teammates when Northern Ireland take on Republic of Ireland in Thursday's friendly international at the Aviva Stadium. The Northern Ireland midfielder admits there's already been 'a bit of slagging' between himself and Millwall duo, Shaun Williams and Aiden O'Brien ahead of Thursday's mouth-watering clash. And while the main aim of Michael O'Neill's team is to tune up for the crunch UEFA Nations League clash against Austria at Windsor Park three days later, Ferguson is hopeful of having the bragging rights when he returns to The Den after the international break. "It's big," he smiled. "We're all looking forward to the game and it's going to be a great atmosphere at the Aviva. I've got a few mates on the (Republic) team as well so there will be a bit of bragging rights. "We're all really looking forward to it and we're training hard now. It should be a great game. "At Millwall Shaun Williams and Aiden O'Brien are there and they've already been starting the slagging, so hopefully we can send those two back quiet after the game," he laughed. "Hopefully we're the ones laughing after the game." Northern Ireland have lost their opening three Nations League Group 3 games and Ferguson is hoping they return to their best form ahead of their second meeting with Austria who narrowly beat them 1-0 at the Ernst-Happel-Stadion. "We're playing great it's just sometimes maybe a bit of luck isn't going our way. We're working really hard on it and we've just got to get back being a difficult team to beat. "This game against the Republic is good preparation going into the game and we can look at what we can do better form previous games and try to rectify that."